There were magpies scattered through the little park. 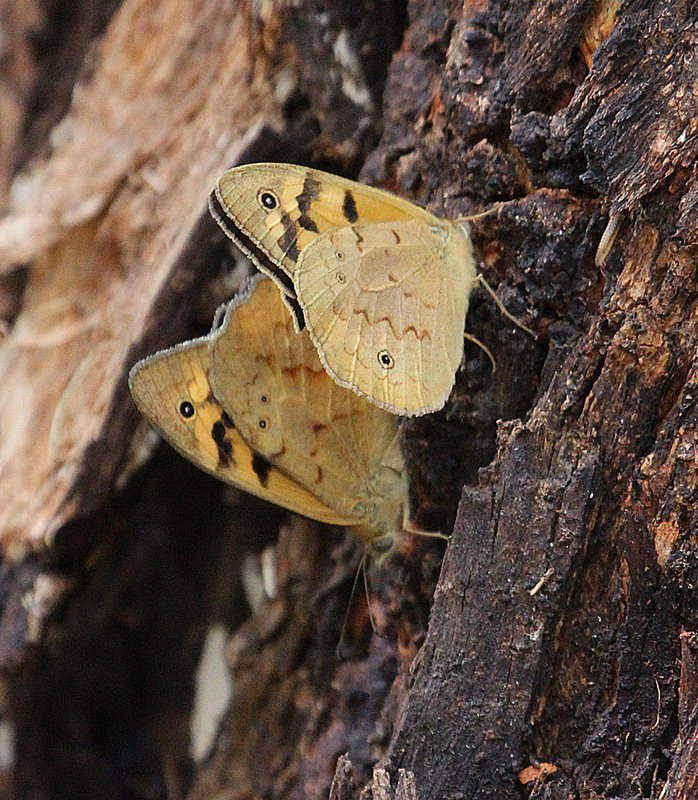 I had seen them high in the trees and foraging nervously amongst the undergrowth. Every time I came close to one it would fly off and perch on a branch and watch me suspiciously. Suddenly, a small group of what I surmised must be sub-adults because of their grey flecked backs, decided to congregate in the understory just a few metres away from where I was sitting. They warbled and strutted and then seemed to organise themselves into a group. The birds moved in a skirmish line through the leaf litter chasing butterflies and raking through the ground with their powerful beaks. Every so often one would lift up its head and gulp down a grub then return to the hunt. I was perched on a fallen tree branch, clearly in their way but the birds just kept coming closer, brimming with the confidence that youth and inexperience bestows on many species including our own. 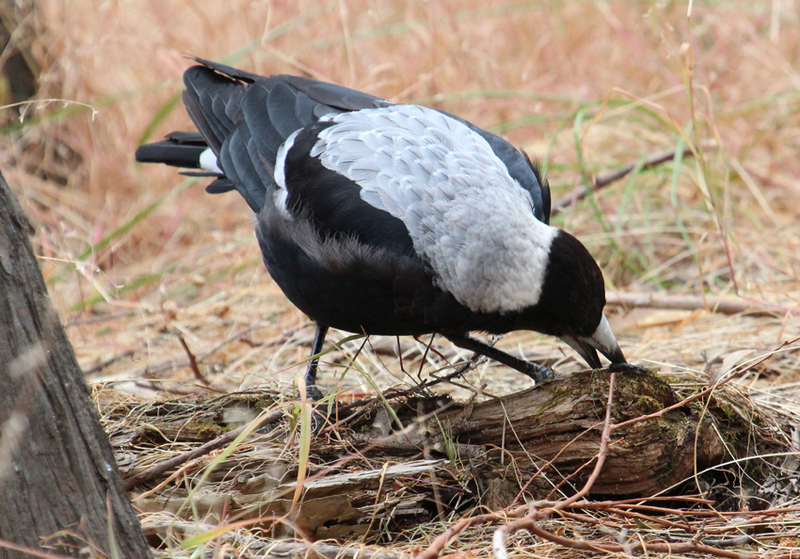 Australian magpies (Gymnorina tibicen) are actually a member of the butcherbird family. They are medium sized, robust birds growing to around 44 cms in length with powerful stabbing beaks that are used for digging out ground based prey and for defence. Magpies live in groups of 2-24 birds with distinct social stratification- several high status females usually breed with a dominant male and the remainder live on the periphery helping to protect nests. 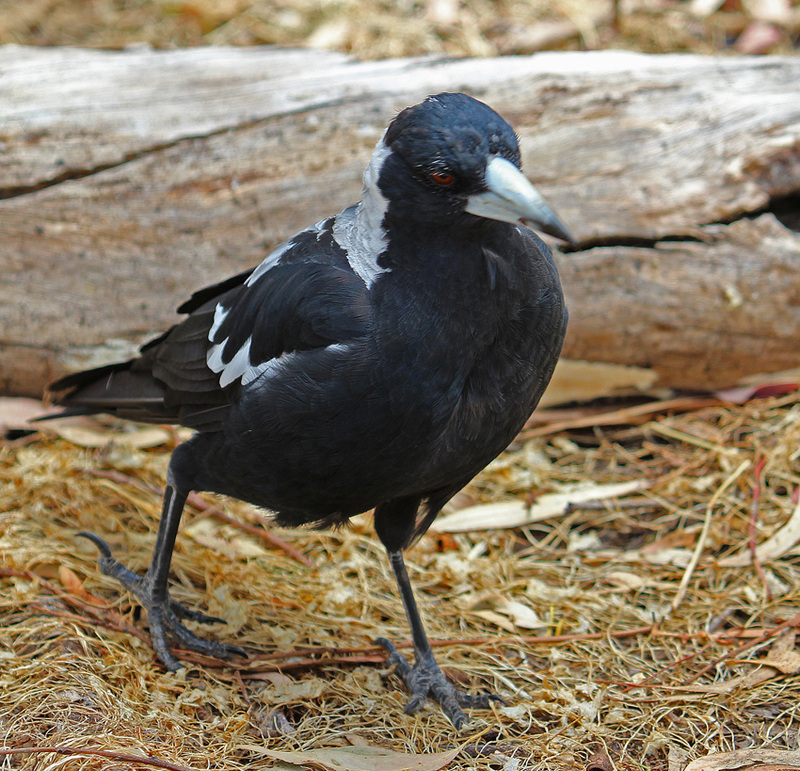 They are extremely territorial during the breeding season and many a cyclist, golfer or innocent pedestrian crossing the parklands will tell tales of being attacked by dive bombing magpies. 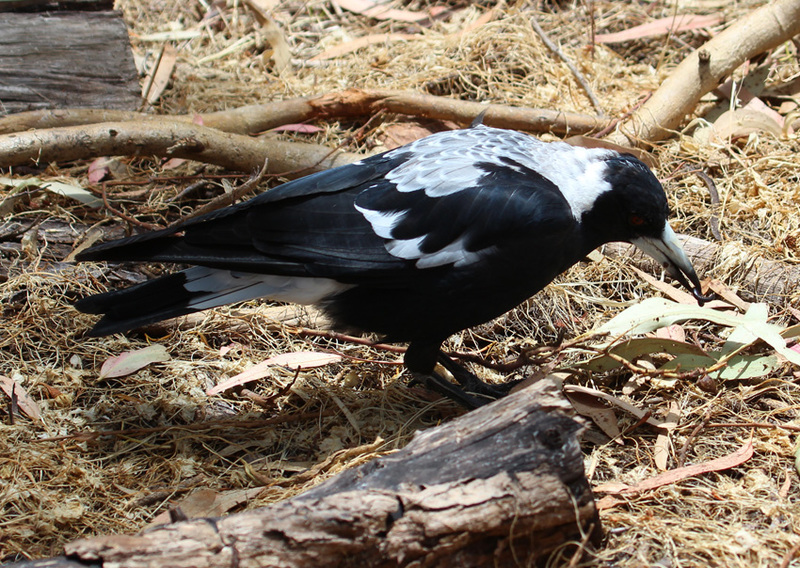 My far less adventurous magpie moment occurred inside a little conservation park in Burnside, one of Adelaide’s more affluent eastern suburbs quite close to the hills face. The park is classic scrub reminiscent of the way the plains would have been before European settlement. Tall eucalypts and native pines dominate the upper story and a variety of low bushes including spiky acacias form the mid range vegetation. Being the end of spring, there were still quite a few flowering plants amongst the leaf litter and fallen branches. And when I sat quietly and watched intently it was possible to catch glimpses of tiny brown skinks searching for prey in the jumbled layer of leaves and bark. However, magpies were not the only birds using the park. 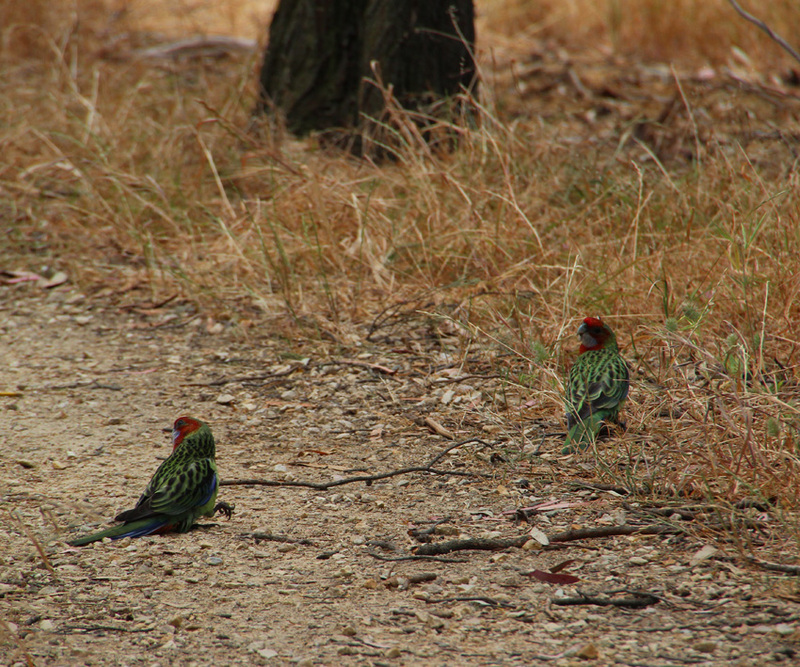 As I entered through a side gate I watched a pair of Adelaide rosellas nibbling grass seeds on the path a mere 20 metres away. And the usual suspects; noisy miners, new Holland honeyeaters and some tiny, twittering finches, all added to the sounds and sights of my walk in the park.